This post is the Executive Summary of The Washington Region’s Economy in 2017 and Outlook for 2018 and Beyond. The Washington region’s economy outperformed its beginning-of-the-year forecast in 2017 growing at an estimated 2.1 percent and improving significantly on its 1.1 percent gain in 2016. While still not outperforming the national economy (GDP), the region’s economy has recovered sufficiently to closely mirror the current and projected near-term performance of the U.S. economy (see Figure 1 below). In spite of the uncertainty introduced into the region’s economic equation by the new Trump Administration with its threats of “draining the swamp” and “shutting the government down might be good for the economy,” and proposing to shift significant budget resources from domestic agencies (and closing more than 30 smaller federal agencies) to the departments of Defense and Homeland Security, the actual negative impacts of the Trump Administration have been difficult to measure beyond the modest loss of federal jobs during the second half of 2017. The new Administration’s positive impacts (indirect) have included accelerated job growth in the region’s business and leisure travel and advocacy clusters and a stronger national economy that has bolstered the regional economy with rising consumer confidence, increased personal income, growth of corporate income and increased foreign trade. The Washington region’s Coincident Index provides the key aggregate measure of the region’s continuing economic expansion following its Sequester-induced contraction in 2013 and 2014. The Coincident Index was designed to measure the current performance of the regional economy and has now increased (on a monthly over-the-year basis) for 43 consecutive months since April 2014 through October 2017 (see Figure 2), the latest month for which the Index is available. Job growth has continued to exceed the forecast in spite of a low unemployment rate that has reduced the availability of qualified workers with the result that wage inflation and spot labor shortages are impacting several of the region’s major growth sectors (e.g., construction, leisure and hospitality, education and health and professional and business services). The outlook for the Washington region’s economy in 2018 is for accelerating growth (2.3%). This forecast does not account for the expected bounce nationally (0.3% additional GDP growth spread over two years) from the net effects of the recently enacted federal tax law. While it is still unclear what the net effect of the personal and corporate income tax changes will be on the region’s economy in 2018, the region’s economy could also experience a small bounce but this could be offset by federal spending changes in the FY 2018 federal budget when it is finally adopted. There is a broad consensus that the U.S. economy will have its best year of the decade in 2018 and the current expansion, dating from mid-2009, will likely extend into 2019. However, it will not maintain its 2018 growth rate beyond one year with economic growth moderating in 2019 and in successive years into the 2020’s, assuming that the current business cycle can be sustained over this period. Global economic and political forces and the emerging imbalances in the U.S. economy, compounded by the uncertainty of the 2018 political season and the political positioning for the Presidential election in 2020, will introduce wildcards to the forecast beyond 2018 and require continuing vigilance to protect against unexpected surprises across the region’s public, not-for-profit and business sectors. 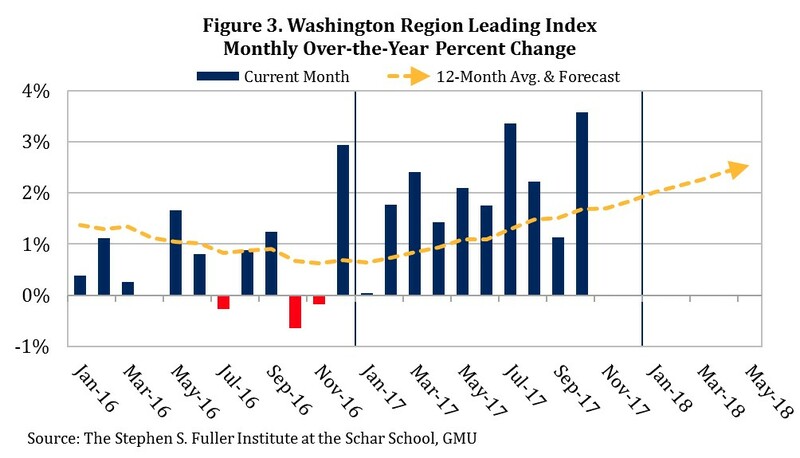 For the short-term, the Washington region’s Leading Index, designed to forecast the economy’s performance six to eight months in advance, is pointing to continuing growth in 2018 (Figure 3).